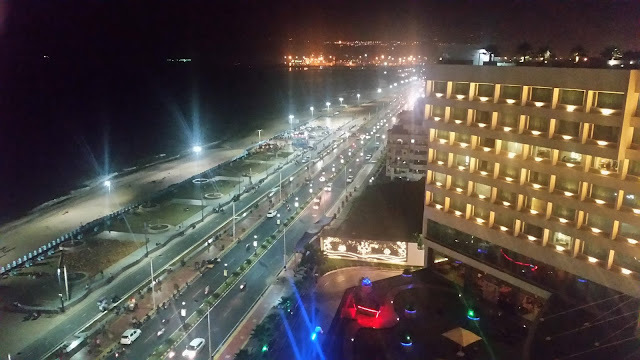 To provide their loyal clientele more options in dining, the restaurant is in the process of introducing a new menu. 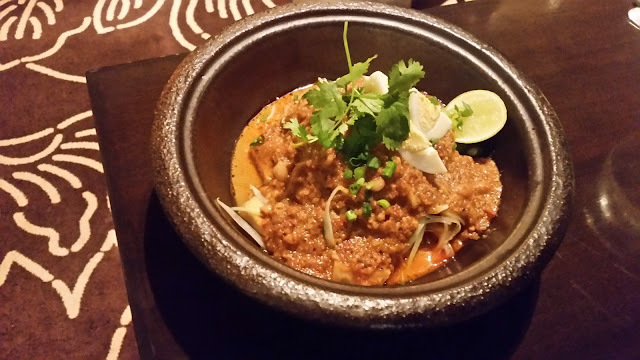 The new menu is curated by Sous Chef Azrul Samah, who has been specially brought in from Hyatt Regency Makkah. 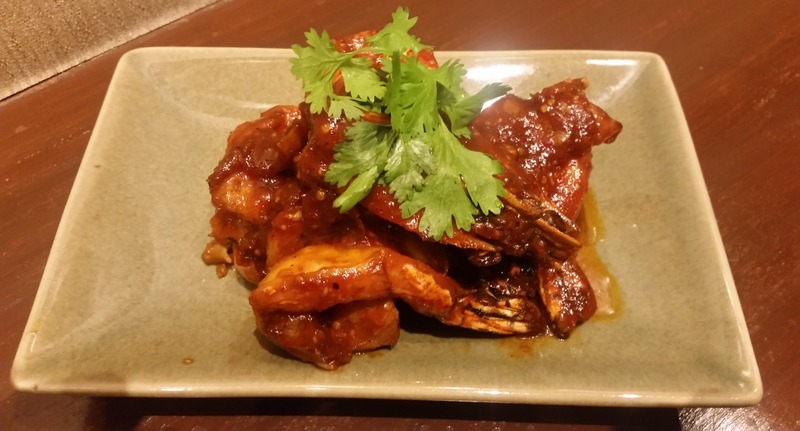 Originally from Malaysia, the chef has wide experience in Thai, Malay, Chinese and Indonesian. As per him, the new menu has been inspired by the wide culinary traditions of oriental countries, including the offerings from the streets. The restaurant organized a tasting session of some of the dishes planned in the new menu for select food bloggers. The first dish that Chef Azrul presented was Gado Gado, an Indonesian street food of mixed vegetables and boiled egg in peanut sauce. 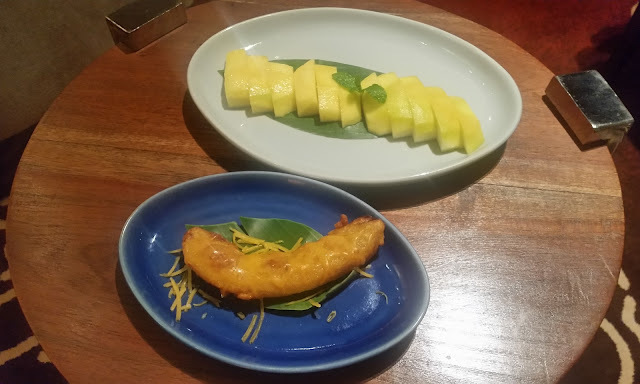 The bloggers had recently seen a live demonstration of this dish from Chef Teku of Park Hyatt Chennai at this same hotel. Chef Azrul’s preparation however quite different, with a lot more sauce in it. I am not a fan of tofu but was fairly impressed with the crispy skin Stuffed Tofu. A sweet chilli dip served with the triangle shaped tofu pieces was delicious. Chicken Murtabak which followed next, however, was a complete hit. Murtabak is the Malay version of an Arabic dish, which has travelled to so many cities in Asia and assumed different names (such as Moglai Parota in Kolkata, Baida Roti in Western India and Martabak in Saudi) and served with different accompaniments. 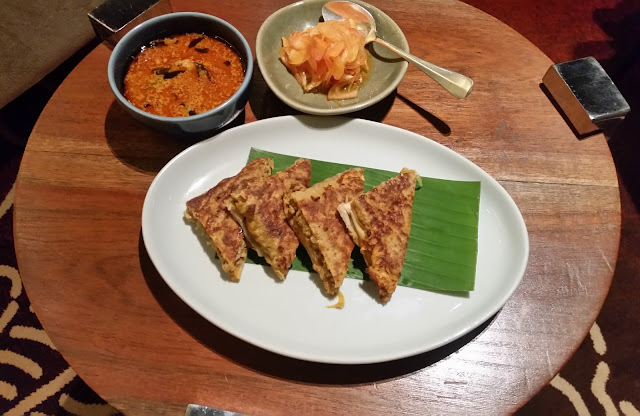 The Murtabak here had a filling of minced chicken and eggs, and what I especially liked was the Malaysian chicken curry served with it alongside pickled onions. This dish is typically eaten as breakfast and evening snacks in Malaysia. Curry Laksa is a well-known dish of South-East Asia, having subtle variations in Thailand, Singapore, Malaysia and Indonesia. The noodle broth here was not very thick with a curry like spicy touch. Some nice Sambal was served with the dish. Another favourite of mine from the day’s menu was Singapore Chilli Prawns. Large prawns with heads retained braised with chilli sauce definitely warranted a second helping. Apart from the zing in the sauce, the prawns were very fresh. The best-styled dish was Roasted Chicken. It was looking delicious when it was brought to the table. A whole chicken is marinated in select herbs before roasting. The Ginger Rice served with it was a perfect foil to it. 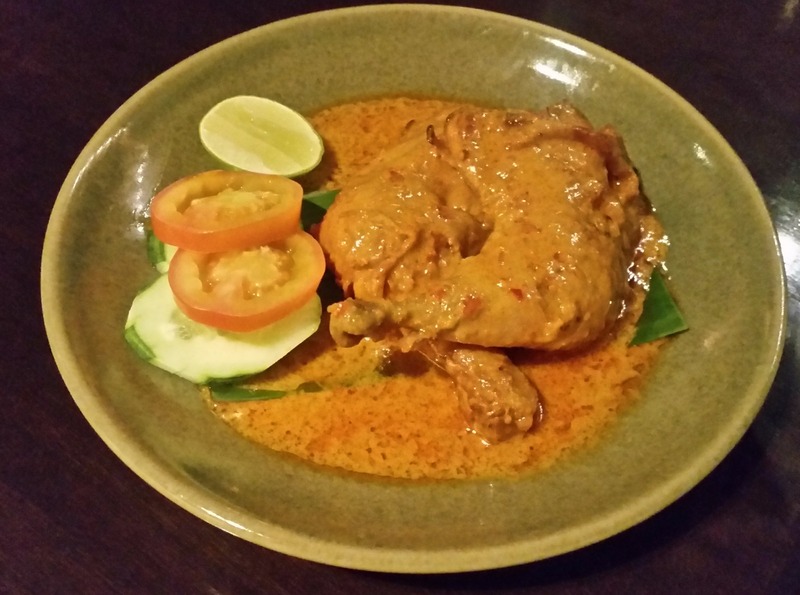 Chicken in Perchik Sauce (Ayam Perchik) is quite popular in the streets of Malaysia. The sauce has a base of coconut milk infused with spices and herbs. This was a gravy dish to be eaten with noodles or rice. The last dish on the menu was Lamb Rendang. 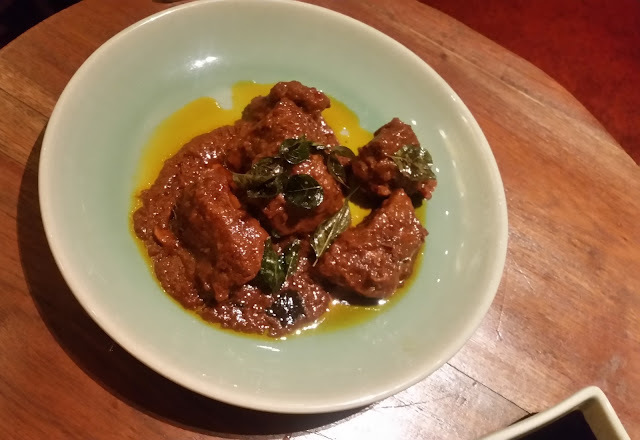 Rendang is a favourite dish of mine from the Indonesian cuisine, the preparation here was darker and had more oil than the usual ones. The spices here were very rich and had overwhelmed the taste of coconut milk to an extent. We ended our meal with Banana Fritters and some fruits. The items at the preview surely looked very interesting and showed the efforts which have gone in curating the new menu. 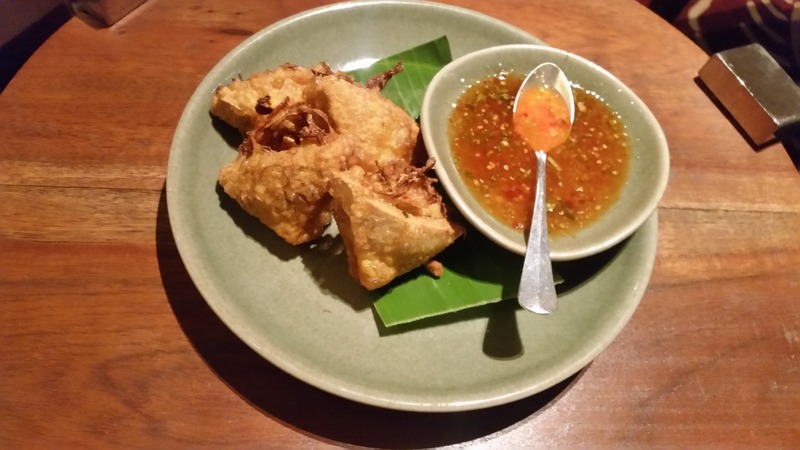 Most of the dishes could capture the original flavours and would appeal to the palate of a lover of oriental food. With the extremely attentive but unobtrusive service from the fine dining restaurant, a quiet dinner here will now be an even richer experience with the new items on the menu.